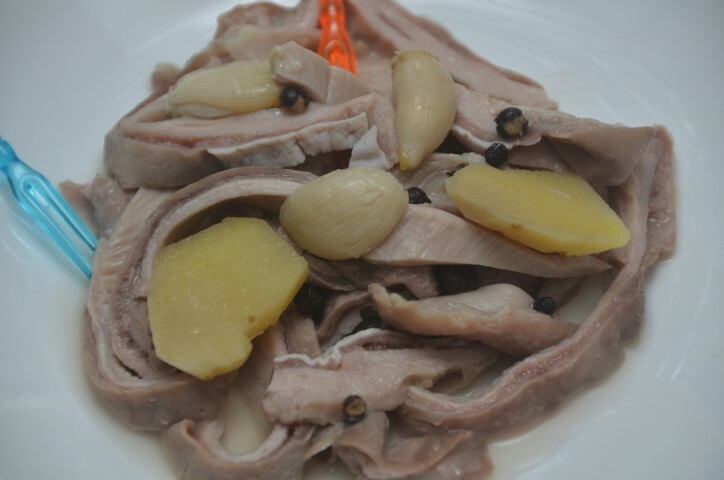 Braised pig stomach with whole peppercorns (bao tử hầm tiêu) is a very popular food item among many of my Teochew and Vietnamese relatives (both in Vietnam and in the States). It's a lot of work to make this dish from beginning to end. Prior to cooking, the stomach needs to be super clean inside and outside. There should be no hint of any bad odor at the end of a good cleaning according to my grandmother and aunts. They (grandmother and aunts) tell me stories of the tedious steps on how to clean a stomach that has been removed from the pig. 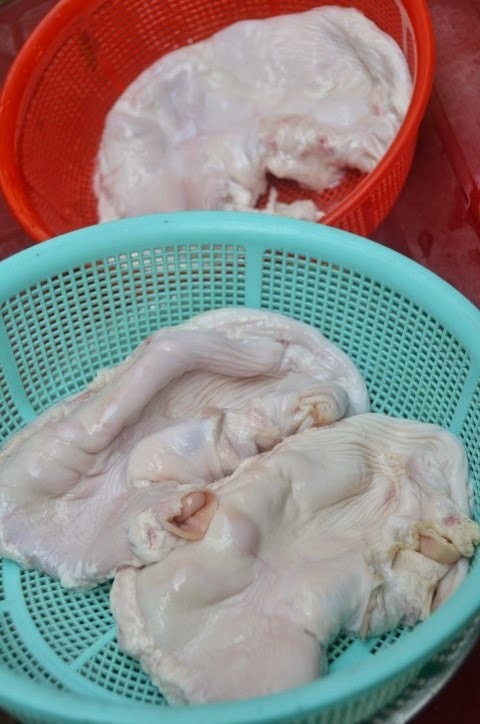 The fatty interior is removed, cooked and and given to the dogs (which supposedly makes a great treat for any Vietnamese dog!). The outer and inner layers are rubbed against hot oil and salt until the slime goes away. Then both sides must be scraped clean using more salt. After a thorough cleaning my grandmother slowly braises it with whole peppercorns and garlic for many hours until tender. 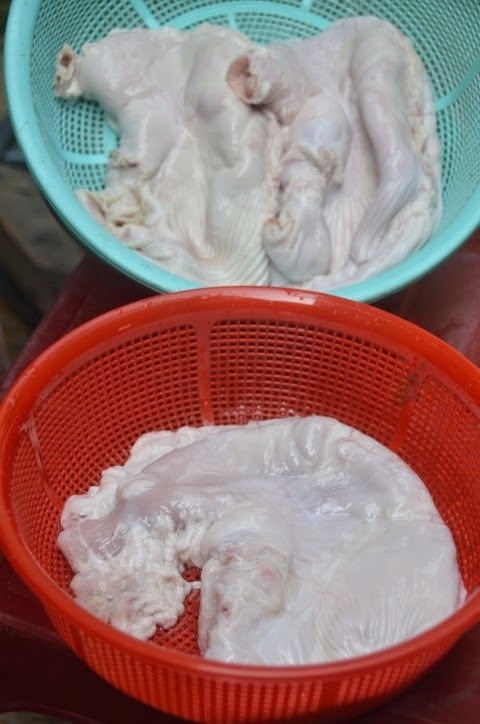 I visited Si Y (my fourth maternal aunt) in Bo Thao and she gave me an already cleaned pig's stomach to take home. She buys her stomach from a trusted source where the pigs are healthy. Avoid eating from a sick pig or a stomach with parasites! Si Y instructed me how to make this dish for my grandmother. She braises her stomach whole. My grandmother and my eldest maternal aunt braise it in pieces so it will cook faster. After receiving the stomach I kept it in the refrigerator. The following day I woke up early and spent basically the whole day slowly braising it over charcoal (which took about 8 hours) in order for it to be tender enough for my grandmother to eat. If you do this it is best to put it in a crockpot so you can spend your time doing other things instead of tending the fire! It is more economical to make several stomachs instead of just one as you can see in this recipe. 1) Put enough water in a medium pot to flow over the stomach. Heat the water until just boiling. Turn the heat low or spread the hot charcoal out to keep the heat low. 2) Either cut the stomach into 4-5 pieces or keep whole. If you keep the stomach whole (as my aunt's way) then put about a tablespoon of whole peppercorns inside. Seal the stomach opening with a bamboo skewer or pull the flap of the stomach opening in to prevent the peppercorns from coming out. 3) Put the stomach and about 1 tablespoon of whole peppercorns in the pot. Add more hot water if needed so the whole stomach fully submerge in the water. Keep the lid partially covering the pot. 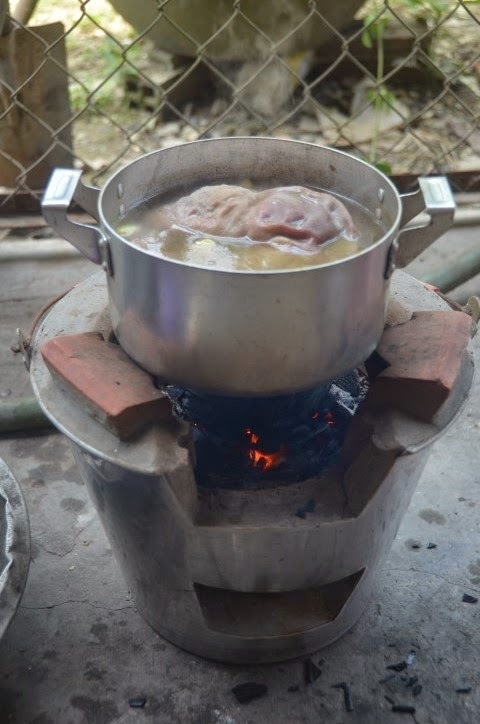 4) Let the liquid simmer until the stomach is somewhat tender (about 6 hours or depending on your fuel). Add more water as needed to keep the stomach submerged. 5) In a separate small pot boil the bones for about 4-5 minutes. Remove the bones and rinse clean. Add the bones to the stomach pot for the last 1 1/2 to 2 hours of cooking. 6) For the last hour add garlic and season with MSG and salt to taste. 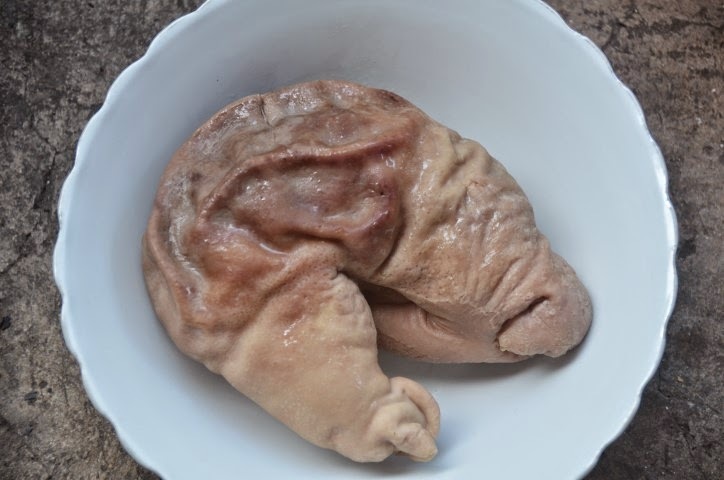 *My aunt in Minnesota tells me she can buy pig's stomach in her local market for about $2 USD each. I know in New Hampshire you may purchase pig's organs from some farmers. 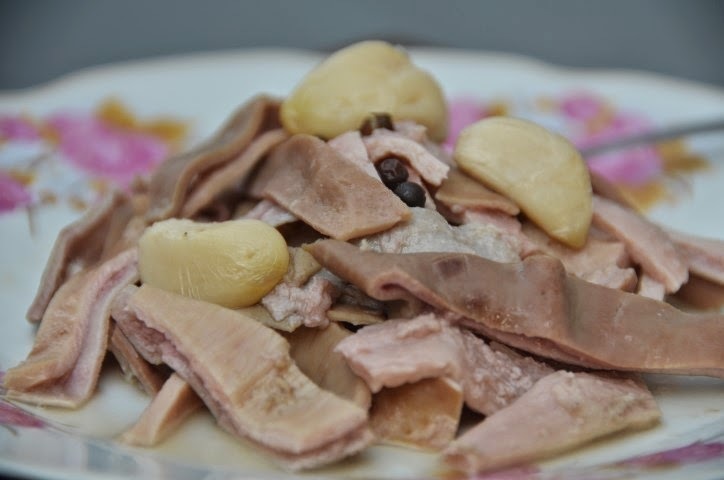 In Vietnam the stomach is quite expensive (for Vietnamese standards) due to popular demand. It is best to buy from a trusted vendor. *Be sure to clean the stomach well before cooking. If you are unsure on how to clean it well then please do not attempt to cook and eat it. *Make sure the stomach is parasite-free!! *How to test for tenderness: You may take a piece and bite into it. If you can chew and bite into it then it is ready. You can also take a chopstick and pierce through the stomach. If it goes through easily then it is good for eating. *I don't normally cook with MSG but my grandmother and aunts prefer to use a little in this recipe. I just made 2 stomachs using almost the same ingredients as above except I added a few thick slices of ginger to the pot. I did not use any pork bones or MSG this time. After I cleaned, scraped and rubbed the stomachs with salt to clean them well I boiled them in water for about 5 minutes. Then I removed them from the pot and washed both the stomachs and the pot well. 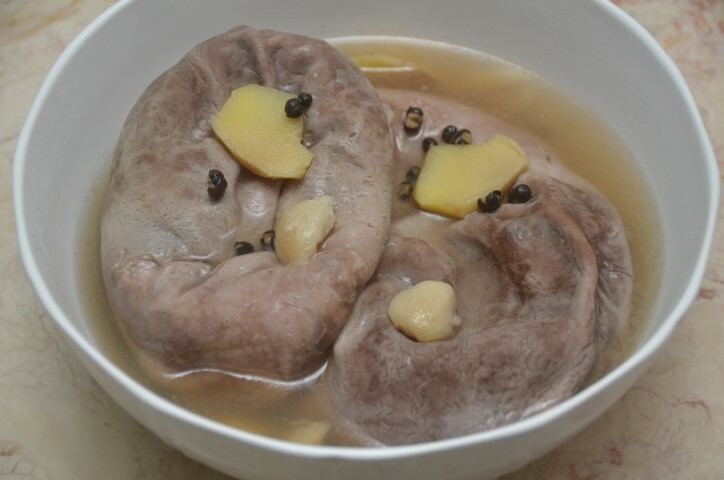 I returned the stomachs to the pot (I used a heavy Dutch oven), added fresh water enough to cover the stomachs, added a few thick slices of ginger, 4 large garlic cloves, about 1 1/2 tablespoons of fresh roasted whole peppercorns and seasoned with salt. Once the water started to boil I turned the heat to medium low to a simmer, covered the pot and let the stomach cook until soft. This time it took me about 3 hours to cook them. I think the Dutch oven is a great invention. It really retains the heat well and makes everything cook so much faster and more efficient!! If you can stomach it (no pun intended) then this is a very tasty dish! *These stomachs came from H Mart (Korean market) located in Burlington, Massachusetts. Be sure to clean these organs further when you bring them home before cooking. These were relatively clean but I can tell you these can never be too clean! It still took me about an hour to slice off the fat, scrape and clean them thoroughly. I was craving this dish and was looking for the recipe when I stumbled on your blog. What a lovely and touching story. Thank you for the recipe and the wonderful story. Hi Brittney, thank you for your comment and for stopping by!